Have you noticed that your iPad 2 is behaving strangely or inactive? It is likely that a particular part within your device could be the cause. And should that be the situation, you may not have a good deal of option than to hard reset your ipad 2. The need to hard reset iPad 2 may be necessary if the device has become inactive or crashed. This implies you cannot open apps and pushing the “Sleep/Wake” or “Home” button does not do anything. Additionally, when updating your iPad 2, you may come across several bugs and unexpected issues, a few of which are related to installation and others, related to 3rd party iOS apps. All of these issues can be fixed through hard reset. However, it should only be done when all other attempts have failed to resolve the problem, because the process will erase all the data on your iPad 2. When you plan to give, sell or send out your iPad 2 for repair, it is essential you completely delete all your personal data to avoid any security threats. It is always wise to play safe. By manually deleting data or narmally resetting your iPad 2 is not permanent. Data can be easily recovered by some tool. However,you can wipe data to be 100% unrecoverable by using iMyFone Umate Pro or iMyFone Umate Pro for Mac. It's an all-in-on iOS data eraser that will completely reset iPad and ensure data is completely gone, which is much safe than normal reset. Many famous media gave high comment for iMyFone Umate Pro, like MacWorld, iPhoneinCanada, APPKED. Step 1: Connect your iPad 2 to computer and run iMyFone Umate Pro. Step 2: Choose “Erase All Data” tab and click on “Erase” button. Step 3: Type “delete” into the box to confirm and start. Once iMyFone Umate Pro start to work, the wiped information cannot be recovered. Thus, remember to backup your important data before erasing your iPad 2.
iMyFone devotes itself to the maintenance of the current functions and also the development of new features. 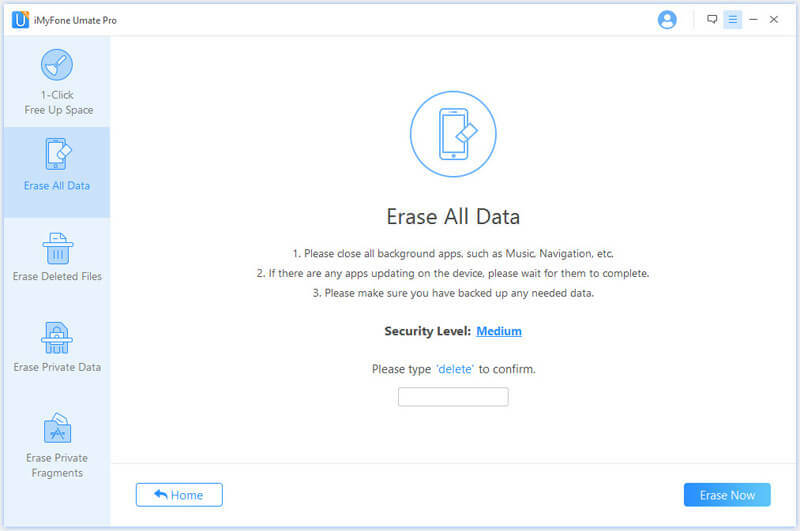 To permanently delete your personal and private data, 2 other erase modes are highly recommended to you. You can selectively delete your unwanted files. Erase Private Data: The same as “Erase All Data”, data erased here will not have any chance of recovery. You can preview all your personal data here and select some of them to erase. It only has the ability to erase default app data, but now it can also erase WhatsApp, WeChat, and other third party app data, which all other iOS data erasers do not have. Erase Deleted Files: Files deleted normally can be recovered very easily, but iMyFone Umate Pro will show these deleted files and completely erase them with no possibility of being recovered. Of cause, you can preview first. The same as “Erase Deleted Files”, it supports to erase WhatsApp, WeChat, SnapChat and other third party apps. The above are the key features of iMyFone Umate Pro. But it also has another basic feature as a iOS space cleaner. 1-Click Cleanup: In just one click, you can erase temporary files, clean up junk files, compress photos or backup and delete photos, Remove unused apps and Delete large files. 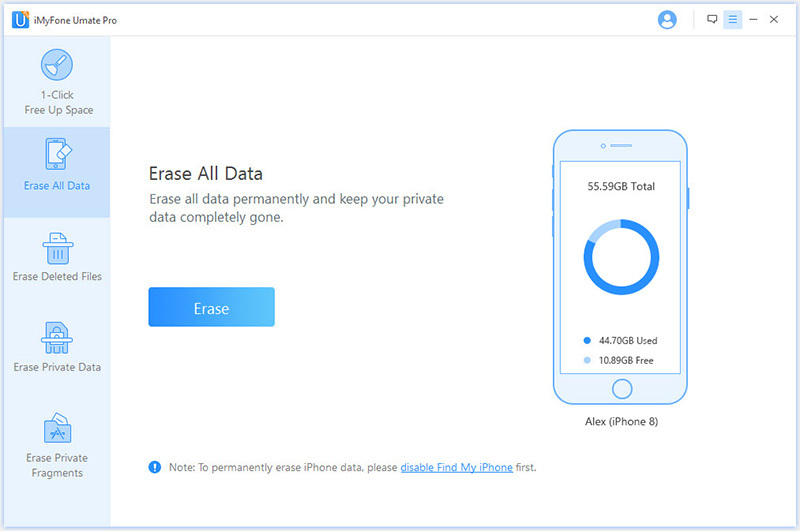 iMyFone iPhone data eraser will completely delete these unwanted data, free up large space and boost your iPad. Junk files is for free trial in iMyFone Umate Pro.